Sublime Sound: Mobile Fidelity Reissue Corrects the Dry Sound That Plagues Previous Editions! Davis’ Third and Final Pairing With Arranger Gil Evans Yields Watershed Innovations. Flamenco-Themed 1960 Set Develops Synergy Between Orchestrations and Melancholic Jazz Phrasings. Urge by Davis to Develop Techniques Possessed by Forbearers Finds Him Expanding Palette, Spinning Webs of Lyrical Sound and Emotion. Mobile Fidelity has never been prouder to have the honor of handling efforts as important as Davis’ key recordings. It’s why the label’s engineers have taken every available measure to insert listeners into the space occupied by Davis, bassist Paul Chambers, drummer Jimmy Cobb, percussionist Elvin Jones, and the 18-piece orchestra. With both Evans and Davis attracted to the blues undercurrents permanently entrenched in the Spanish flamenco strains, listeners can finally wholly detect the myriad microdynamic tonalities, brooding ostinato devices, and minor pedal points that stamp the compositions with divine sensibility and goffered effect. Multi-note motifs, brief improvisational solos, fanfare sweeps, and contrapuntal exchanges inform the flamenco-spiced pieces, but so do unconventionally voiced instruments that come into full relief on this reissue. Davis’ Harmon-muted trumpet is abetted by an assortment of bassoons and French horns that create pleasing contrasts and sounds (pp, mf, ppp) that get to the heart of Sketches of Spain: splashes of color. Seldom, if ever, did Davis ever so expressively and liberally paint with color. And in Evans, he has a likewise-minded partner to help draw out variegated shades, adamantine layers, and striated distinctions. 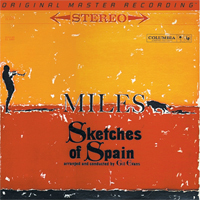 Whether it’s the somber mood piece of the standout “Concierto de Aranjuez (Adagio),” renowned forDavis’ flugelhorn performance, or the folktale-based “Solea,” Mobile Fidelity’s enhanced Sketches of Spain transfixes with playing, ideas, and innovations that remain exclusive to this incomparable record.